As Romania is an unforgettable country, and your marriage or honeymoon is also supposed to be like that, I think you can have the both in the same time. That's why I would like to propose you Romania as the perfect destination for honeymoon or/and wedding. But first of all, you must fill the first condition: you must be deep in love, over the ears! Then if you are looking for the best location for your marriage, please consider The Kiss Gate. 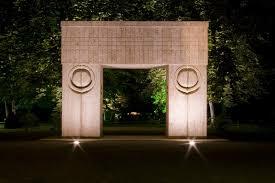 It is a modern sculpture carved by Constantin Brancusi, an artist we are very proud of, lieing in a central park of the city of Targu Jiu. It not at all unusual having there your civil ceremony, and many Romanians do the same thing. Simply unique and unforgetable. 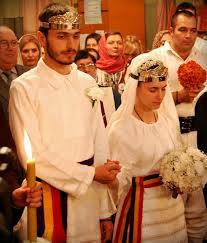 After that comes the religious ceremony, at least for us the orthodox. It lasts one hour and is very touching for sure. If you like to live it (my warm recomandation) and you are not an orthodox you need a prior baptisation. Almost 90% of the Romanians are orthodox, but you can also find many other churches, as we, the Romanian orthodox are very tolerant. The next could be the wedding party. 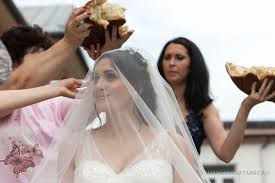 Usually there are 300 guests eating and drinking all night long, waiting to dance with the bride and keen to give to the young pair a present for the good start in the common life. If you can understand the words of the Romanian popular songs you will laugh a lot, some of them are really funny. And then I am sure you don't need whether a guided tour, nor to be part of a group. Take really care of your beloved one, put her/him first, even before you. This is the real love, and this is the secret of a long happy marriage. The passion is there, but you need sometimes the patience, please remember that. 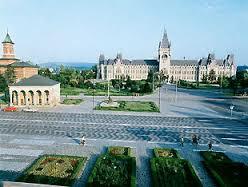 and about the location, I would reckon the wonderful city of Iassy for many reasons: there are a lot of students , plenty of clubs and concerts. The city is not so impressive big as Bucharest, but also not a small insignificant provincial town. Not at all, but on the contrary, as Iassy has been for centuries the Capital of Moldavia. You will be able the feel the arrogance and pride of a former capital and visit some of the renowned buildings and museums of the city (there are a lot, if you are a culture freak is the perfect destination). One hotel of Iassy has been drawn by Gustave Eiffel, that would be another recommendation. I think is a nice busy schedule, and must disappear, as I don't intend to disturb your honeymoon in Romania. The Baltic countries feature rare landscapes, clean beaches, tranquil islands, majestic cathedrals, sky-high spires, palaces and so on. All are worth exploring. Norlendatrip offers quality travel assistance programs for Baltic Tours. Our travel assistance packages include day trips, weekend excursions, group tours and the like. To know more about the services we offer, visit us at www.norlendatrip.com. If you wish to contact us you may call us at +37067645548. You can send us an email at incoming@norlendatrip.com. Contact us today. travel agent in bangladesh From obokash.com.